For many years I did not realize that many of my traits were related to my temperament. That I am an introvert, empathic and highly sensitive. I knew that small talk and large social gatherings exhausted me. I knew that I relished time alone and needed time to recover after a busy day of activities especially if those activities involved interacting with people. I think other people had a hard time understanding this behavior. Once I understood it was part of my temperament, and that it was ok to be this way, it made it easier for me to accept myself. 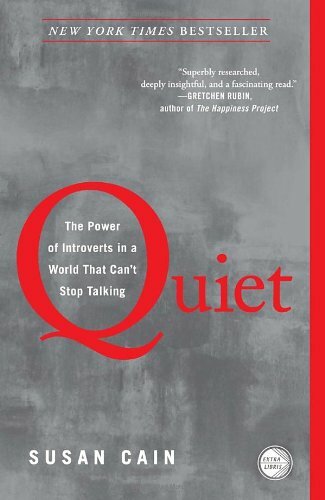 In a TED Talk Susan Cain explains traits of introverts and talks about how our society has not traditionally seen this as a positive trait and that the needs of introverts in schools and work places have been ignored. The idea of constantly working in groups is seen as the ideal. She makes some good points about how it may not be the ideal. In a post about The Quiet Revolution on her website she talks about plans to redesign the workplace and school environments to be more in line with the needs of introverts, and develop the leadership skills of introverts in the workplace. This is interesting and worthwhile information for introverts and the people who love them. It is worthwhile for parents and teachers to be aware of this as well. This entry was posted in Blogging, Current Issues, My Life and tagged Blogging, Introverts, Susan Cain, Temperament on March 13, 2015 by Deborah Drucker. Of an introvert, I meant… Darn auto correct still has winter on its mind! Well it is true that extroverts have been valued over introverts, at least in the West. There is value in both extroverts and introverts and some people are somewhere in the middle. It is supposed to be on a spectrum. I understand that Asian cultures have traditionally valued introverts. An excellent post and a fascinating TED lecture, Deborah. I think I accepted my introversion a while ago; it makes life a whole lot easier. Thank You Anna. ❤ Yes and there are many good things about being introverted. It is good to know ourselves and accept ourselves definitely. I can completely relate to this post. I honestly did not realize that so much of me that other people did not “get” was due to me being an introvert. It’s only recently that I became aware of how much that plays a part in who I am and how I interact with others. It took me a while to learn about and truly accept myself. I think the more everyone learns about these inborn traits there will be more acceptance and understanding. I sure hope so. When I’ve brought this up with a few people they seemed a little resistant to the idea that there was more to it than me being moody or impossible. They could watch the TED talk with Susan Cain. 🙂 and her book is a NYT Best Seller and good reviews if they want to read about it. I shared different articles on facebook….. I’ve got some people in my life that prefer to blame it on me being a difficult person. lol That’s okay. I know what’s going on and I’ll keep trying to inform them. At least my husband is finally getting it because he’s heard me say so many of these things (without the introvert label attached) for so many years. Now he sees that it’s not a choice I made. Even without the label, we have a right to have our needs respected. Good for you for sticking up for yourself. Thanks! It’s not going over very well but hey, that’s not my problem. It’s not like I’m being rude, unkind or disrespectful. I hope you will take a minute to read this post by Deborah from Notes Tied on the Sagebrush. It’s all about introverts. If you are an introvert, it will give you some affirmation. If you aren’t an introvert but would like to read more, it will definitely fill you in! Because of where we live (30 minutes away from one of the 7 Natural Wonders of the World) we constantly have house guests, most of them friends but also a few ‘hangers-on’ – all wanting somewhere free to stay while they put ticks against their bucket list. In the last year the most Piet and I got to spend on our own in any given month was 10 days! While I love company (sometimes, with the right people), I have always NEEDED to be alone sometimes! When the guests are here I have found myself wanting to spend more and more time either in my office or bedroom, reading, blogging, sleeping or just sitting and staring out of the window – just to get away from all the noise and bustle. I would *really* like to write a post about this but some of my friends read my blog and they might get offended (sorry for ranting here 😀 ). I was beginning to think I was turning into a misanthropist but after reading this I think that perhaps I am actually an introvert (and I seem to be getting ‘worse’ with age!). It would certainly explain a lot. Thank you for sharing (and listening 🙂 ) and for helping to settle something that has been worrying me for a while. Drained is a good way to describe the feeling! I know, I should set limits but, like you, I feel guilty about that. I did make a start with the last lot we had – I said “no” when they asked me to take them sight-seeing and arranged a taxi for them instead. It was quite liberating (and wonderful to have the house to myself while they were gone 🙂 ). Good idea about setting limits and calling a taxi for your guests. Keep taking time for your needs. It is important. You don’t have to be available 24/7 or be a tour guide unless you want to.